Obesity isn’t a simple thing. It is the result of many inter-relating factors. In simplistic terms, obesity is caused by consuming more calories than the body can burn. From there it gets much harder to explain. Obesity isn’t caused by overeating, it is caused by such things as genetics, environmental factors, psychological reasons and a multitude of other things. Factors that cause one person to gain weight will have no affect on another person. 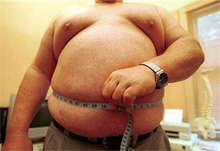 There are; however, many factors that all weight gain victims have in common. Age can be one deciding factor. Between twelve and eighteen months a child is more likely to gain weight than the months before and after that period. Starting at age twelve and continuing to approximately sixteen years of age there is another time of quicker weight gain. As an adult, there seems to be quicker weight gain by those that area already a victim of excess weight. Heredity is also plays a large part in a person’s weight gain and loss ability, but this is not meant as an excuse for failure, this is information to help you meet the challenge. Interestingly, adopted children tend to have the same weight specifications as their biological parents as opposed to their adoptive parents. The other thing you get from your family is your lifestyle and eating patterns, these items also play a large part in the weight gain syndrome. It is not only how much you eat, it’s what you eat and when. It’s also when you do not eat, such as a habit of skipping breakfast. Stress, unhappiness and depression also contribute to weight gain because of the plethora of comfort foods available on the market and the human nature of eating more when stressed. Once you have eating connected to a certain emotion, your body will automatically prompt you to reach for comfort food when that emotion exists. Most eating disorders be they constant overeating, binge eating or any of the other eating disorders, can be linked to some sort of behavioral issues or psychological issues. If your lifestyle is complacent, if you are lethargic by nature, you will have a weight problem. Your body reacts to needs, if you place no requirements upon it, it will become overcome with fat and move in a vicious circle. Fat does not break down calories into energy, It is only meant as a storage facility. If a person is inactive, they develop no lean muscle mass and lean muscle mass is what is the most adept at burning calories. Add to that the fact that an inactive person tends to eat more empty calories in order to pass time, and you have a recipe for extreme obesity. Changing your activity level and your eating habits will go a long ways towards loosing weight. Age also plays a part in, your metabolism naturally slows down and you do not require as many calories in order to maintain a healthy weight. Eating high fat foods will lead to weight gain and constant consumption will lead to obesity.